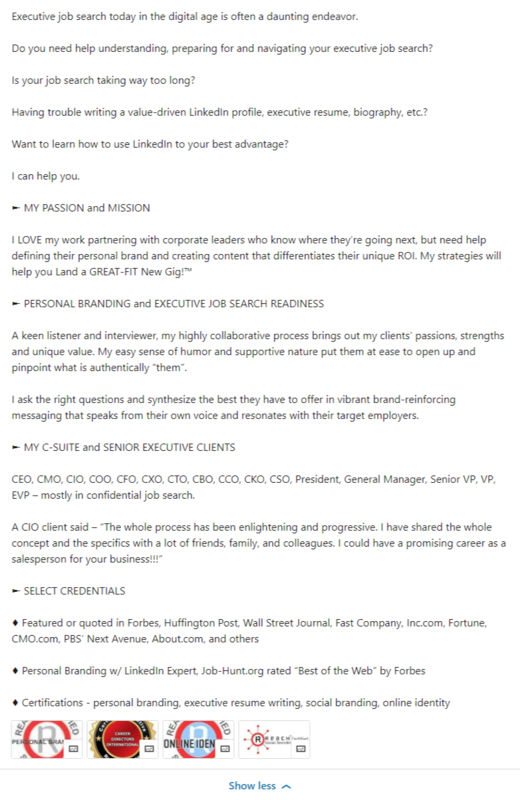 Your LinkedIn Summary is too important to leave blank. And a couple of short sentences won’t cut it either. Get ideas and inspiration on what should go in this important section of your LinkedIn profile. 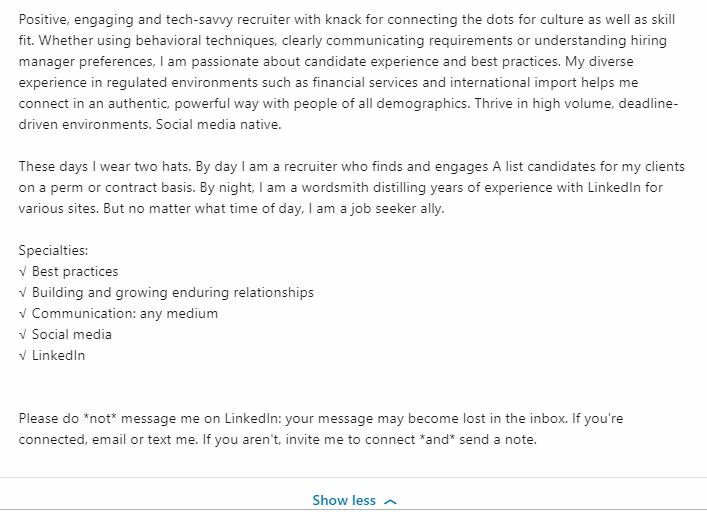 When it comes to writing your LinkedIn Summary, short and sweet isn’t the best strategy. In fact, it may be hurting you. 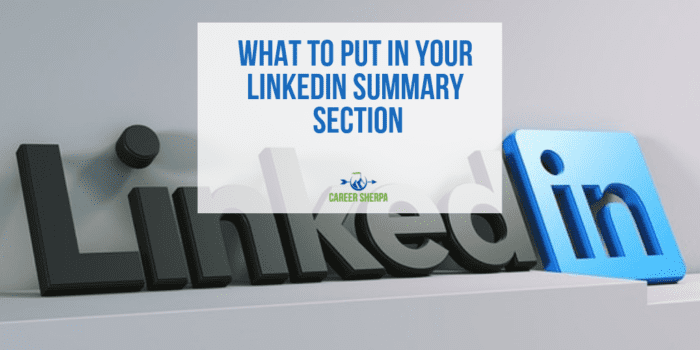 Having 40 words or more on your summary ensures you show up in search results and people with at least five skills listed on their LinkedIn profile receive up to 17x more profile views. Long ago, Human Resources would have to wait until the job interview to learn about you. But today, they can read your LinkedIn profile. This section is your opportunity to highlight your skills and experience. And you can go deeper than this. Explain your motivation, what drives you, or what you are known for. Even if you choose NOT to use this section to share insight about yourself, others will. And because they’ve provided more information, the recruiter or HR rep gets a better sense of their fit. Your Summary is kind of like your pitch where you answer the question “tell me about yourself.” Humans are curious creatures and you can use your summary to answer questions about who you are. You have 2,000 characters, use them wisely. First things first. Write your summary in the first person. Use “I,” “me” and “my”. It is your profile, you are writing it so use your own voice and personal pronouns. Make your summary easy to skim. (No one reads anything anymore.) This means short paragraphs, white space, clear subsections. Only the first two-three lines are viewable without having to click “show more.” Use these lines to convince the reader they need to see more. You can do this by talking about the problems you solve for companies, the solutions you’ve implemented, or a teaser of some sort. Avoid including information they can already see when looking at the top of your profile (city, your headline, education, or last job and employer). Don’t be generic or vanilla. Use your own story to highlight what makes you different. One of the best features of your LinkedIn Summary section is the ability to embed files. Video, weblinks, photos, and pdfs. This means you can show samples of your work. If you’re comfortable, why not include a video and explain your career that way? Get more tips here. Use the same logic businesses do when writing web content. They provide a compelling reason to do business with them. They talk about the problems they solve, what makes them different (and better) than the competition and how they are unique. They use SEO (search engine optimization) strategies to make sure someone searching for their service will find their page. You may choose to include your contact information (email and/or phone number) to make it super-simple for people not connected to you to reach out. If you are actively job searching, this can make it easier for recruiters to contact you. Want more help maximizing your LinkedIn profile? Check out this 20 point checklist. Don’t copy these. 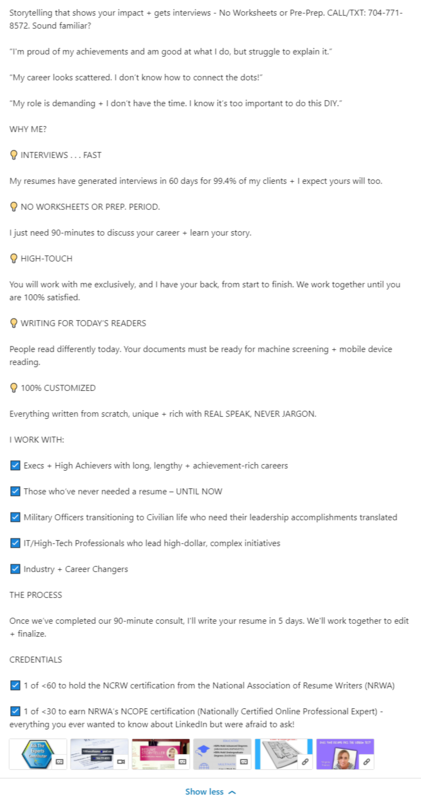 Use them to generate your own amazing profile. Do you need more help with your LinkedIn profile?